Happy Friday everyone! Today’s post is coming to you from the colorful streets of San Jose del Cabo, one of the most charming cities I’ve ever visited. I love the small town vibe, the mexican flare and of course, all the quaint shops and galleries lining the main square. If you are headed to Cabo, I definitely recommend spending an afternoon there, window shopping and picking up fresh mangos at the fruit stands. I hope your weekend is as cheerful and colorful as the city of San Jose! Love everything about this look! That dress, those colors, and those amazing gladiators! Where can i fInd this dress?! 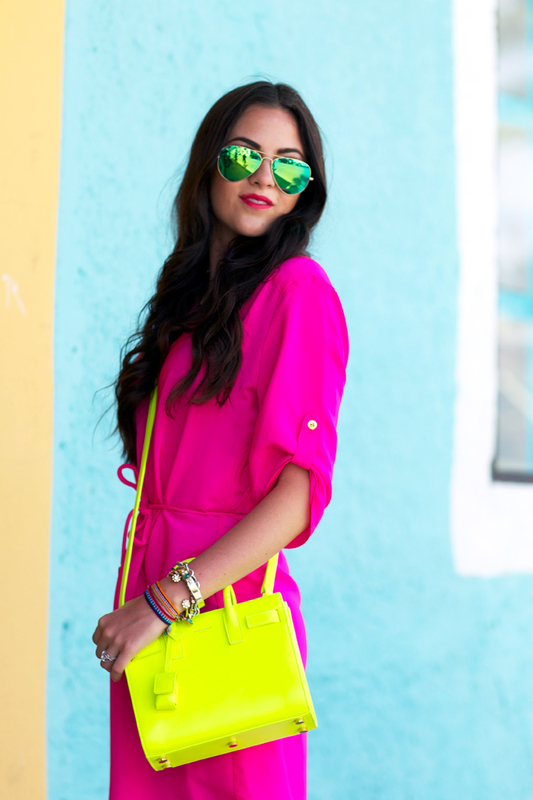 Love this bright fun look and those gladiator sandals! Definitely thinking about snagging them in black! Love this color combo! That Amanda Uprichard dress is beautiful! I have one of her dresses in a different style and same color! Beautiful vibrant colours and I’ve been eyeing that saint laurent bag for a little bit now ..it’s a beaut! Love that dress, the color is so bold and pretty. I’m glad you posted this today. I really wanted to see this look cause you posted half of it on instagram. Great vibrant colors. Love the bag! Fab colour for summer. I love these bright colors, so beautiful! Love the bight colors! That dress looks so easy breezy. Perfect for a tropical get away! The color of that dress is beautiful! I love it with the contrasting color of the bag! LOVE AT DRESS!!!! I have almost an identical one in green! Love the pops of color!!!! Makes me want to jump on a plan to Cabo stat. WOW! One of my favorite looks you have ever shared, Rachel. The bright colors together are insane and that is definitely your shade of pink. Love the Stuart Weitzman sandals… I’ve wanted them forever, but at 5’3 I think they might be too overwhelming. You may have just inspired me to give them another try! Obsessed with that bag! Love the riot of colours….and I adore your sandals…although I don’t think my legs are long enough! Love this outfit! It’s very you with all the neon. Thanks for providing a cheaper bag option! Love this look, the sandals are amazing!! Sounds like an amazing place to visit–I hope I make it there one day! Beautiful dress but those sandaals!!!! omg! your cabo trip looks so dreamy! we are headed there in June so we will definitely need to put this on the to do list. that bag!!! <3 <3 <3 love your colorful stack of bangles too! Love all the bright colors and those gladiators are so fun! I love San Jose Del Cabo. Love the bright colors. You look great as usual! I see that the Stuart Weitzman sandals are a huge trend this year. Love this look! I’m just as obsessed with neon as you are! Glad you had fun on your trip…looked amazing! Love the colour of the dress,great pop of colour with the purse. Neon looks great on you. Those sandals are awesome. This fabulous look is definitely among my favorites!! 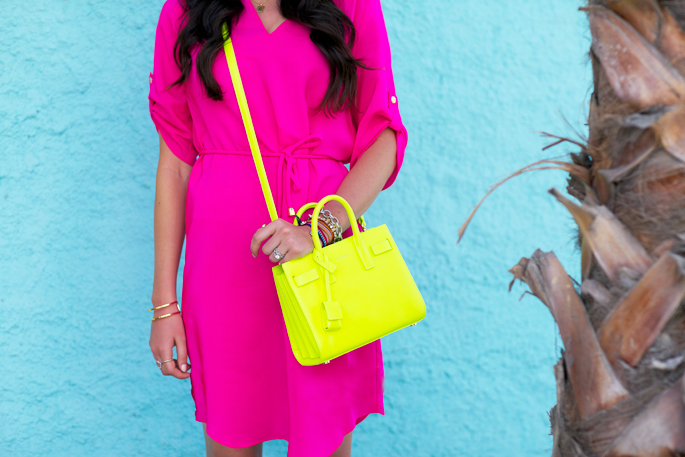 The dress is perfect and the neon purse is incredible!! Those gladiator sandals are gorgeous on you!! Love it all, Rach!! I love everything about this outfit. I have been on the hunt for the perfect gladiator sandal for summer, and I think you helped me make my decision. Thanks for the inspiration! This is so pretty! Love the pops of color. I do a weekly best of the blogger round up and I might include this one! Beautiful bright colors perfect for Mexico vacay and spring/summer…you look great! so colourful rachel! love it! You are my total woman crush! Such a fun color Rach! Love how you aren’t afraid to pair bold colors together. Loving your toe nail polish as well! Beautiful!!! Love this colour combo! Adore the pink & neon yellow combo!! A very “chic” look for a bright vacay day! Hi guys! I just started a new fashion blog; heifashion.tumblr.com . Come check it out! I am posting pictures of my outfits, my wish lists, the best bargains in fashion out there and more! Also, if you have a fashion blog or are interested in outfit inspiration and feedback come over to my page and contact me! Great colourful outfit. Can summer come any faster?! I love the dress and neon bag! Such a wonderful color combination! Obsessed with your sandals! Perfect outfit! Such a pretty dress! Love that color on you…and looks great paired with the trendy gladiator sandals! 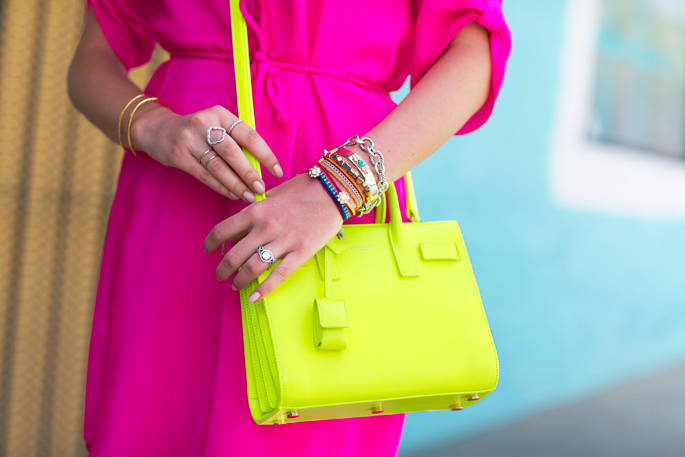 Loving all the neon and bright colours! What a perfect vacation outfit! I LOVE this adorable yet daring outfit!! The colors are so cheerful and the gladiator sandals are to die for! Love these bright bold colours together and those gladiator shoes are amazing! This style of dress seems to be popping up everywhere, I’ll have to pull mine out and start wearing it. However I think I need to start looking for one that is bright like this one. I love that dress paired with those sandals!! So cute! I love that dress paired with those gladiator sandals! So cute! Great outfit! The neon is perfect for the tropics. I’ve never been a huge fan of neon but the bright colors look great! Love the sandals! love how colorful your outfit is/was. seems to match the environment in cabo perfectly! So much love for that gorgeous dress – the colour is incredible. I really enjoy following your blog and at this moment I am loving all of the bright outfits you are posting! Hot Pink is definately my favorite!! I have been stalking those Stuart Weitzman shoes! Look fabulous!